Here are two prime examples of Leina’s writing. I rummaged through her room and pulled these out from under her bed. Everything ends up under her bed. It is the black hole of our house. But I thought these two missives best represent Leina. I love the “in a jify”. That just cracks me up. Clearly, the child has seen her fair share of infomercials. The second letter I often receive is not so sweet. I think of them as letters from a broken heart. 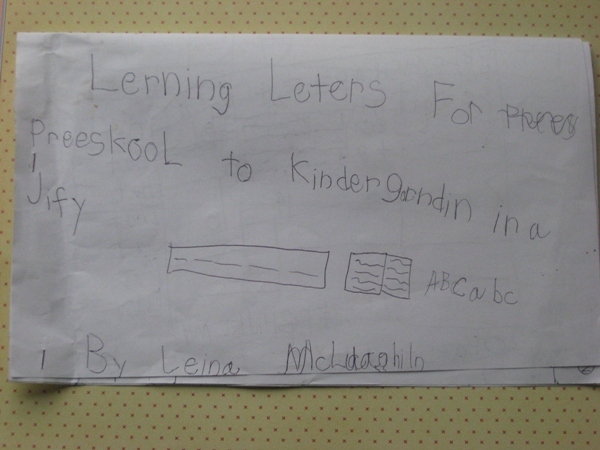 Whenever Leina is wronged, she takes up her pen/pencil/crayon/marker, and lets the world know of her pain. I believe this letter was created after we insisted that she go to sleep. By herself. In her room. I know, we are horrible, horrible parents. The P.S. just slays me. It’s written in ascending order. Hence the strange numbering system. But it did work. After finding this note on my bed, I headed to her room only to find her fast asleep. So, I scribbled a note of my own and left it for her. I love finding all her thoughts and ideas and feelings lying about on bits of paper. I hope this writing stage goes on for a long, long time. This entry was posted in Leina on January 18, 2011 by Chrissie. I always get apology notes from my girls when they have been sent to their rooms for doing something naughty.